Storage space for the Clip Art Collection is provided by www.rrhistorical.com. Check our site often for your favorite Historical Society, Museum, Tourists Railroad and other Railroad Related Information. Many of the images here have been made available through the courtesy of Ken Houghton of Houghton's Rail Images and are marked with a (KH). The other images are from the collection efforts of NMRA members Jack Pettee and Roger Hensley. This collection will be updated periodically in an effort to keep the largest practical collection available. All Clip Art is in GIF format. Please feel free to use any of the clip art here for personal use, on Web sites or modify them to suit your needs within the following limits. 1) If you wish to use any of Ken Houghton's clip art for a newsletter or other publication, please give credit to Ken Houghton Rail Images. 2) The Conrail registered service mark notice must remain with the Conrail logo. 3) Where there is a circle R (R) or (TM) Trade Mark symbol on or with the logo, please include it when using it. No credit is necessary for any of the other images. 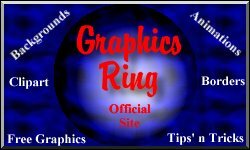 This Graphics Ring site is owned by www.rrhistorical.com. [ Next Page | Next 5 | Prev | Prev 5 | Random | List Sites ] Want to join the ring? Get the info. We are sorry to announce that our stock of RR clip art is just about exhausted. We do not have an endless supply of these items nor are we artists that can draw up new ones. Therefore, we are doing away with the "What's New" page and will only be updating this collection as we happen to receive or come across new clip art. When we do, the new items will be included in their appropriate categories so you will need watch for them. For all of you desiring specific clip art, we're afraid that "what you see is what you get." We are also eliminating the E-mail service as it just takes too long to prepare the messages and transmit 2 megs worth of files. Therefore, it will be necessary for you to download the clip art files that you want yourselves. Instructions for downloading: We can't speak for every browser in use on the WWW, however to download using the most popular of the browsers available you first open the file you desire, use your "right" mouse button and click on the image and then tell the browser where you want the image filed on your computer. We are providing the following links to pages that have railroad clip art in color. Not all of the clip art on these pages is free, so be prepared for that fact. Last Revised June 4th, 1997.